Free Shipping Included! 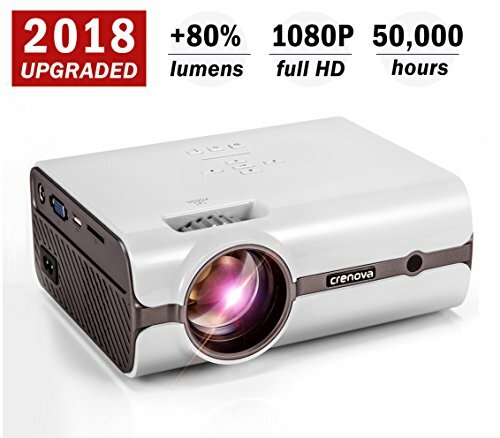 Projector, 2018 Upgraded (+80% Lumens) Crenova XPE496 1080P HD Home Portable Video Projector (PC/MAC/TV/DVD/Movies/Games/Outdoor USB/SD/AV/HDMI/VGA Input) by CRENOVA at Home Entertainment Centers Online. MPN: XPE496. Hurry! Limited time offer. Offer valid only while supplies last. BIG PICTURE IN A SMALL PACKAGE - 80% higher lumens and brightness over similar HDMI projectors in its market due to innovative square-pixel technology. The 50,000-hour lamp life projects crystal-clear, big-screen images with rich 1080P sharpness for years to come. Even in brightly-lit rooms, the vivid colors make this the ideal home projector for all your entertainment needs. 50% LESS FAN NOISE FOR SUPERIOR PERFORMANCE - A newly-enhanced cooling and fan system generates the least noise of any home projector Crenova has ever brought to Amazon. By enabling outstanding engineering, we've created the most enjoyable home entertainment experience at an unbeatable price. SMARTPHONE/LAPTOP/TABLET CONNECTIVITY - Easily connect any Mac, PC, Smartphone or Tablet with an HDMI dongle or a DisplayPort to HDMI Adapter. If your device doesn't support HDMI there's also SD/USB/MHL connectivity. POWERFUL & PORTABLE - The full-1080P / 2200 Lumen / 220 Lux Peak Brightness / 1000:1 Contrast Ratio all combine to project a crisp, radiant image for anywhere life takes you. whether you're watching on a wall in your house or on a sheet in your backyard. LEADING WARRANTY - Every Crenova purchase comes with our risk-free, 12-month warranty (REPLACEMENT OR REFUND) and LIFETIME customer service. Contact our 24/7 technical support or Facebook page for any questions or concerns. At Crenova, our goal is to deliver impeccable customer service and impeccable home entertainment products.